If you ever have guests in town and are trying to get them to give up their quaint New England hamlet, their chemical dependence on Dunkin’ Donuts, and their inexplicable love of anything Mark Wahlburg puts on this great earth, take them to Fish for lunch on a Saturday in February. Things start to look a little bit better on this side of the country once you’ve experienced some Sausalito seafood. Fish is a wonderful, wonderful place. The crab roll is otherworldly and the fish and chips are good enough to convince us that British food might actually not be that bad. Does the restaurant have some drawbacks? Yes. 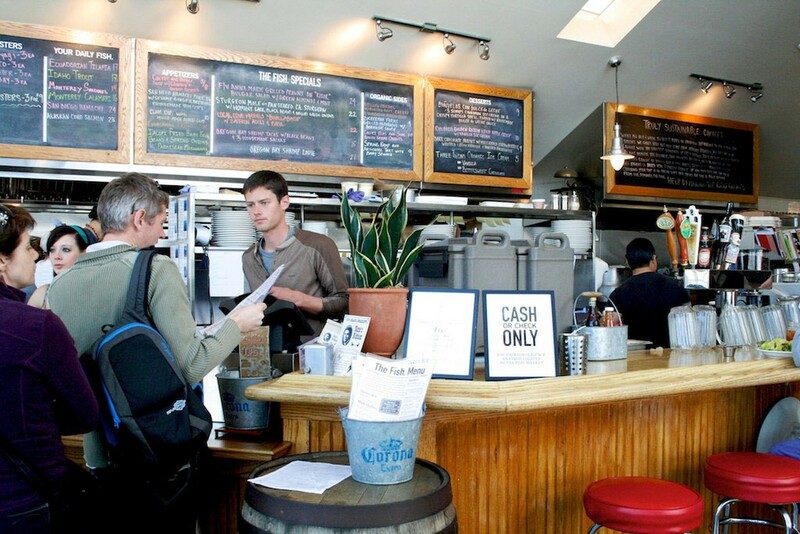 Most prominently, there's the cash-only situation for dishes priced high enough to make you contemplate actually writing a check, if you happen to remember what those look like. Then there's the line, which regularly gets so long you might think they're doling out freshly flown-in NYC bagels in the Mission. But, once you sit down at the picnic tables gracing the courtyard, the food comes out quickly, and as you inhale your crab roll, any thoughts of the line will be a blip on your mind’s radar. It’s that good. Essentially a classier take on Sam’s, the Tiburon seafood spot where bartenders seem to compete for most vodka legally included in a cocktail, the views at Fish of the bay and boats allow you to contemplate such existential questions as “Would it be fun to live in a houseboat? Would it be like the one from ‘Sleepless in Seattle’? Why did I ever live anywhere else besides California?” You can sip your drink from the requisite mason jar and befriend one of the 30 dogs that seem to be attached to every table. Fish is a good place to be, and an even better place to convince your cousin from Worcester that the West Coast might be worth her time. We can see "Ted 2" here also. The only dish that has disappointed us here. The fish is topped with jumbo fried corn kernels, which are too much with the chips and overwhelm the slightly bland ceviche. So much for our shot at healthy. As an East Coast native, I’m a tough judge of clams and cream in a bowl. Fish nails it. This is so good it’s hard not to eat it too fast. The roll is soft, buttery, and fluffy, and the crab is fresh and meaty. Only thing that would make it better is lots more crab. But when isn’t that the case? The fries are mediocre at best. It’s all about the batter, and Fish uses Anchor Steam in theirs for excellent effect. More beer! The wedge "chips" kick the regular fries *ss, and should be the only option. Hearty and fresh, and they don’t shortchange you on the tuna. Best non-fried option. Grilled fish of the day, simple, served three up, with above average salsa. A usual in our rotation when we aren’t looking for something that took a dip in the fryer. The Siren Canteen in Bolinas is still fighting for cheese fries amid San Francisco’s health craze, and we are into it.